Still chilly here back east but I’m craving something feminine & floral when the sun breaks out (although, I love cloudy days!). Guess I’m ready for spring? PETER FLOWERS SUEDE BOOTS ($637), the most gorgeous floral boots I’ve ever seen! These walkable boots have a delicate laser cut floral pattern and have that scrunch style which I find so wonderful with suede boots. 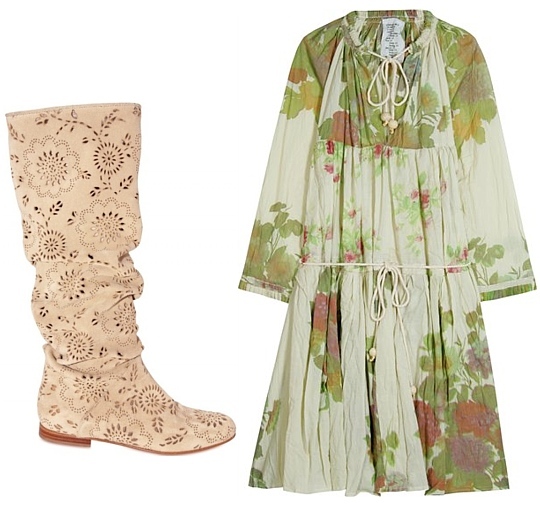 A boxy, FLORAL PRINT COTTON DRESS ($704.16) will compliment the boots perfectly… a match made in heaven. Both the boots and the dress have that vintage/boho feel which I adore. And will age beautifully like fine wine… yum.